Wal-Mart employees are planning to stage their largest walkout ever on Black Friday, the biggest holiday shopping day at the world’s largest retail store. Motivated by strikes at Los Angeles stores before spreading to 12 other cities last month, the walkout is warned by at least one expert to potentially threaten not only their workforce but customers caught in the middle. 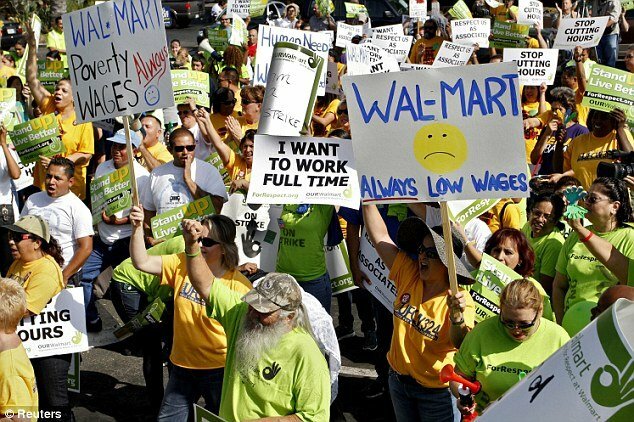 Expecting 1,000 protests both at stores and online is watchdog group Corporate Action Network and Union-supported groups OUR Wal-Mart and Making Change at Wal-Mart. Employees in Chicago, Dallas, Miami, Los Angeles, Milwaukee and D.C. have signed up in the walkout according to Making Change’s director Dan Schlademan. Work stoppages are also planned in Oklahoma, Mississippi, Louisiana and Minnesota. Dan Schaldeman said no specific store locations are being released for fear of worker retaliation ahead of next week. To Wal-Mart the numbers projected are said to be incremental, with a spokeswoman saying those expected to strike are only a small percentage of their 1.4 million workforce. “This is just another exaggerated publicity campaign aimed at generating headlines to mislead our customers and associates,” Wal-Mart responded to the strikes in a statement obtained by KNWA. “Our associates care about providing a great customer experience on Black Friday and we’re confident that’s what customers will have at Wal-Mart this year,” they said. “Even if there aren’t that many people, it could have an effect, because their campaign in front of stores could discourage shoppers,” Ken Margolies, senior associate at the Worker Institute at Cornell University told CNN. Ken Margolies hinted it having a much greater impact if involving their supply centers as well. Strikes did take place last month at one Southern California warehouse as well as at a distribution center in Illinois which supplies Wal-Mart stores. The issues over pay, hours, benefits, as well as employees’ ability to speak up has rallied the workers. “I kept asking myself, <<when is the retaliation for speaking our mind and acting on our rights going to stop?>>” William Fletcher, a Wal-Mart employee in Duarte, California told CNN. With roughly half of Wal-Mart’s stock controlled by descendants of company founder Sam Walton, Wal-Mart’s labor practices have garnered criticism among consumers and have gotten attention in the press, but so far have not affected investors. In 2008, Wal-Mart agreed to pay as much as $640 million to settle dozens of federal and state class-action lawsuits alleging it deprived workers of wages. In the latest lawsuit filed in Chicago last month the corporation is accused of failing to pay temporary workers a minimum of four hours’ pay on days a laborer was contracted to work, but was not utilized for a minimum of four hours. “It’s a successful company that profits $16 billion a year, that can afford to pay its executives $10 million while I can’t afford to support my family on $16,000 a year,” Sarah Gilbert a striking worker in Seattle told AOL. According to Glassdoor.com, the average Wal-Mart sales associate earns $8.83 an hour. If working 40 hours a week, 52 weeks a year, their annual salary would be $18,400. On Wednesday the latest public smear against the company came from the mouth and public arrest of a former employee seen handcuffed while visiting his old store in Orlando, Florida, to talk to workers about the planned strike. Alex Rivera accused managers of intentionally misleading city police officers to cause his detainment, he told The Nation. He now fears that with his former co-workers having seen him in handcuffs for voicing his support against the corporation they will be fearful of protesting alongside him. “They’re going to say, <<If I join the organization and do something like that, this is what’s going to happen to me>>,” he said. “Unfortunately the facts just don’t support what Mr. Rivera is saying,” a Wal-Mart spokesperson responding to his story told the Nation accusing Alex Rivera of ignoring a signed trespassing warning. According to Alex Rivera, that warning was not signed until after his arrest, to the mutual described anger of arresting officers.